A woman desperate to take advantage of Wal-Mart's Black Friday game sales used pepper-spray to ward off her fellow shoppers. How I adore Black Friday, it brings out the best in people. Not a single year goes by without at least one instance of appalling violence in the name of rampant, frothing consumerism. 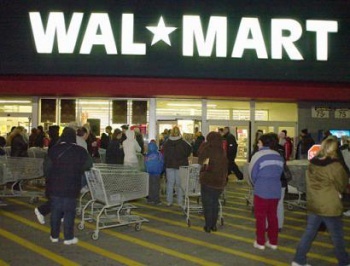 According to Alejandra Seminario, a 24 year-old shopper, who was waiting in line for children's toys when things got ugly at the unidentified Los Angeles branch of Wal-Mart, the incident was sparked by a crowd of nearly a hundred people clawing at the merchandise in a frenzy. In the chaos an unidentified woman broke out the pepper-spray to defend her claim, because nothing calms an angry crowd like pepper-spray. "People started screaming, pulling and pushing each other, and then the whole area filled up with pepper spray," said Seminario. "I guess what triggered it was people started pulling the plastic off the pallets and then shoving and bombarding the display of games. It started with people pushing and screaming because they were getting shoved onto the boxes." Luckily, none of the twenty people caught in the pepper-spray cloud were seriously harmed. While the possibility exists that the woman was using the spray in self defense, police revealed she had used the pepper spray in multiple parts of the store. She was using it "to gain preferred access to a variety of locations in the store," said Los Angeles Fire Capt. James Carson. "She was competitive shopping." How utterly appalling. That being said, a quick blast of pepper-spray to the eyes is somewhat preferable to being trampled to death by a herd of sociopathic deal hunters. Providing there's no sales-based fatalities in the next six hours or so, this is a good year for Wal-Mart.